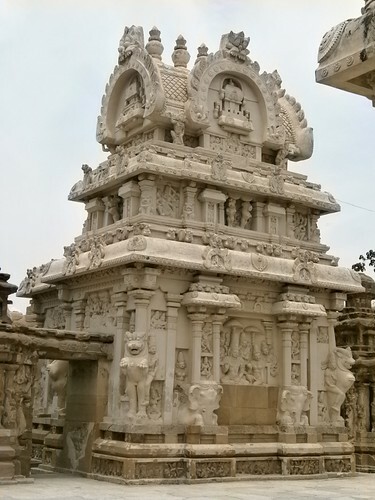 Wikipedia says that Kai-lasa-Nadhar Temple in Kanchipuram is the oldest structural Temple in South India. 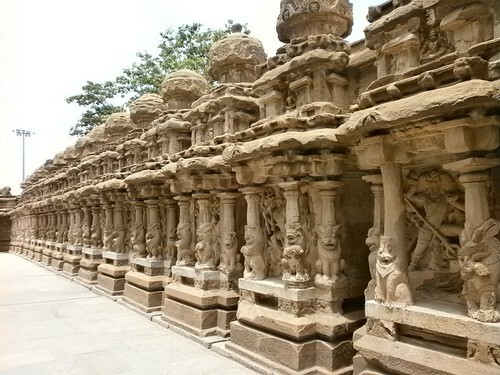 During one of my regular trips to Kanchipuram, I went to see for myself how a Temple was constructed during 685 – 705 CE. Luckily, this Temple has survived – almost intact – for more than 1300 years! Kanchipuram is a South Indian town located at a distance of 90 KM from the modern-day Metropolitan city of Chennai (Madras), Tamil Nadu. This town has written history dating back to the Tamil Sangam Period (3nd Century BCE – 3rd Century CE). 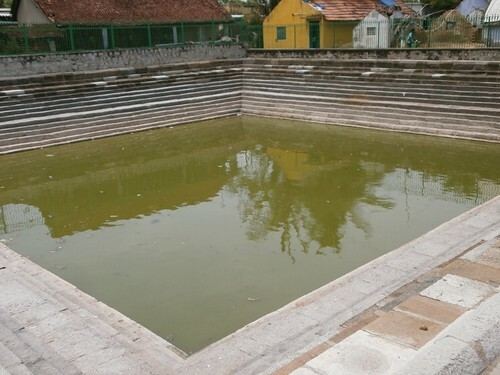 A few literary works of the Sangam period have survived and mention Kanchipuram – that’s how we know now that it has been in existence, at least from then – it was probably established much earlier! 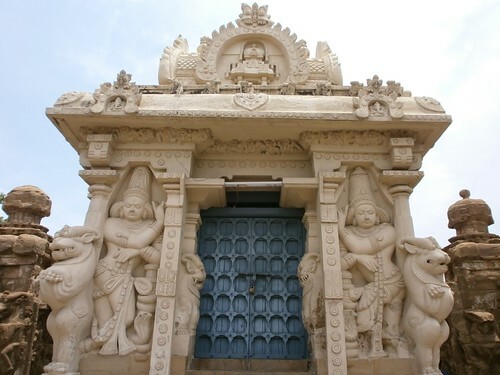 Even though Kanchipuram is a popular Hindu religious center, many (even in India) will be surprised to know that Buddhism, Jainism, Islam (and now Christianity) also played a significant role in shaping the culture and religious fabric of the city. There was a time when Buddhism was wide-spread in India. Bodhidharma, believed to the third son of a Pallava ruler from Kanchipuram, popularized Zen-Buddhism in China. It is said that Hinduism almost became a minority religion in India, which was also swept by the wave of Buddhism. Later on, Shankaracharyas (beginning with Adi Shankara) from Kanchipuram contributed greatly towards the revival of Hinduism, across the nation. Before this Temple, there were others but they did not have the structure we see today. Rock-cut Temples/Temples made of wood from the Pallava period (older than this one) do exist, but the Kailasanadhar Temple was the first Temple to be built with a Gopuram (tower), a Sanctum Sanitorium (Statue of God located below the tower), pathway for circumbulation, four walls across the perimeter, and other features that define Hindu Temples, until today. This Temple is considered to be a huge achievement for the people back then as its planning, design and construction were simply audacious – a project on this scale was simply not undertaken before (in this region). This Temple later became the inspiration for the even more audacious ‘Brihadeeswara Temple’ in Tanjore. 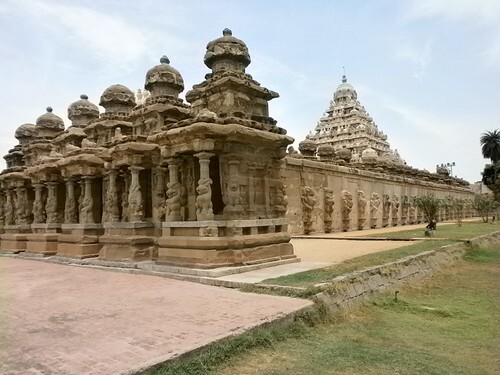 Kanchipuram – I should have told earlier – was the capital city of Pallavas (a prominent South Indian dynasty) and a Pallava King called ‘Rajasimha’ arranged for constructing this Temple. The foundation of this Temple was made of Granite and in spite of the walls being made of yellow sandstone, much of the original Pallava architecture has survived without any major renovations. This Temple is in disuse for many centuries now – maybe that’s why it has survived weathering & wars! There are beautiful stone-sculptures almost everywhere – On the tower, on the walls, on the pillars and almost everywhere else. All around the main sanctum, there are 58 smaller shrines with octogonal towers located next to one another forming beautiful symmetry. 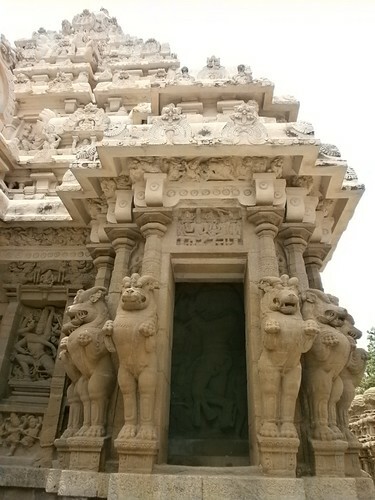 Each tower contains carvings of different forms of God Shiva, to whom this Temple is dedicated. If you carefully notice the photographs, you’ll find a lion-headed animal carved on the pillars. It’s not a lion – it’s a mythical animal called ‘yazhi’ with a lion face. The story behind that animal is now lost – people think it’s supposed to protect the Temple. 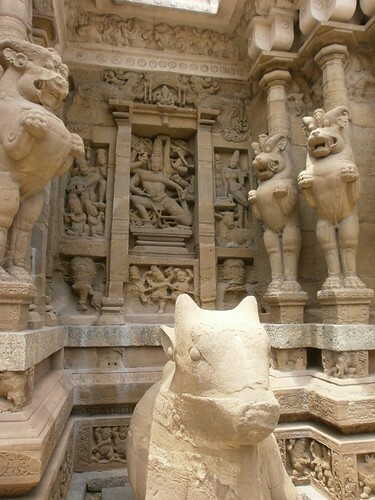 This mythical animal can only be seen in Temples constructed in the early Dravidian architecture period in South India. This Temple sometimes served as a hideout for Kings during battles and a secret tunnel which allows them to escape elsewhere, has also been discovered. This Temple is an ASI protected monument now and there is not much crowd, which is a constant feature in most Indian Temples. ASI has done a good job introducing greenery all around this place and it’s a perfect place for vacationing – for Indians as well as foreigners. This monument is a must-visit not only for its history, but also for it being a living-testimony to exceptional human enterprise, as early as 7th Century. PS: Yaayyy, my ‘Places to Visit’ category has reached 100 posts. I know, I haven’t been visiting many places off late – I hope to do better in future. 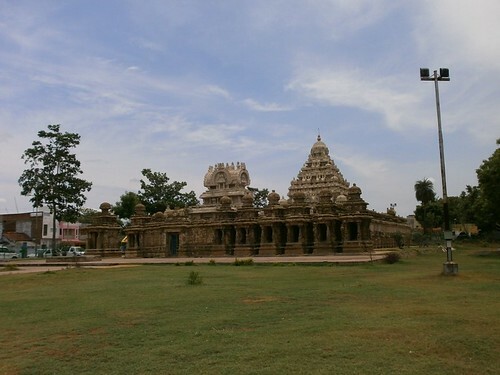 I have heard of this Kanchipuram temple, but have not visited it. 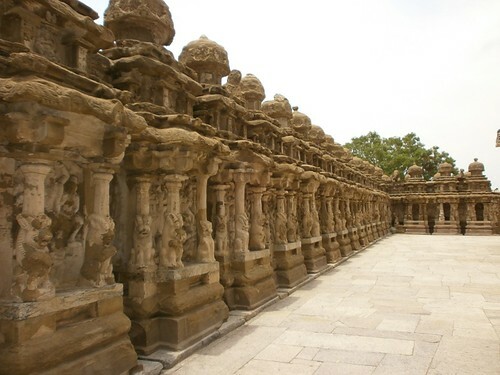 Kanchipuram and Hampi are two places I want to visit. I too want to visit Hampi. There are a couple of other places too in Karnataka where such gems exist. Let me see if I am able to go there in the near future. Thanks for the nice narration and beautiful pictures. It always a pleasure to visit Kanchipuram. Pallava art is also seen in the Temple of Angkor Vat in Cambodia built by King Suryavarman. Yes, I have heard of that Angkor Vat Temple. 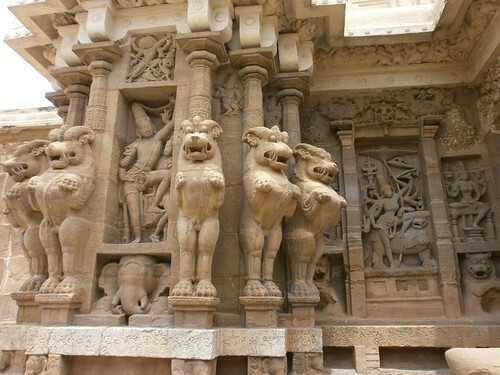 I have seen some photos also – it seems to have been much grander than any Pallava Temple here! Nice pics DI. We visited Kanchipuram just last year. The architecture is amazing. And wow! 100 posts. That’s an achievement. Congrats for reaching the 100 posts in the category of visiting places..
Kanchipuram temple is very famous. I had a great desire to visit it, but could not make it. Your description is so vivid ,i feel I was there. Photographs are marvelous. Thanks 🙂 Kanchipuram Temples – there are many! Temple is beautiful. In some temple shadow does not fall on ground. In modern day imagination, rock garden in Chandigarh is beautiful. That Temple is the one near Thanjavur, I think. I will remember to visit Rock Gardens in Chandigarh – there is one more Rock Garden in Palakkad – that was also nice! I visited this temple 6 months back. I was amazed seeing such old sculptures. Surprisingly the temple was maintained well compared to many sites managed by the Indian Archaeology Dept. But the bad (or good??) part was hardly anybody was there in this temple while the other famous temples in the town were filled with crowd. The auto driver was surprised when I said I had to visit this temple even if that will make me miss the main poojas in other temple. He told me that only foreigners visit the temple nowadays no body else. Such is the fate of the symbol of our ancient good times.. If there is not much crowd, then it is good. It will be peaceful and the littering/damage will be minimum.